My name is Joep, I’m an installation artist that likes to create visually stunning images. Now I am building a new installation which requires very bright, but super narrow search light. These search lights are going to be spinning around, so I will need to build them myself. So far I have deep dived into optics. I am getting close by using a fresnell lens, but I am not yet there. I am struggeling with the following: I can’t seem to get an (almost) straight beam. Hoping you can help me out getting the beam really tight/bright. For the test setup I am using a 100W LED COB, with a 60 degrees lens on it. Pointing in a freshnell, making it look like a normal spot light, but not the really sharp ones as you see in the pictures above. I will keep this posts updated with new results. You need to use a smaller light source with a high luminance. COB LEDs are the worst kind of LEDs this. Maybe try a Cree XP-L HI or something similar. If you want to go even more narrow an Osram Black Flat HWQP (or the soon to be available successors) might be good. A good 100W COB led is around 10.000 lumen, a Cree XP-L Hi will be around 1500 lumen max. If that is enough it is a great choice, but else you could try a Luminus CFT90 at 20A, an expensive led but it may be the best out there for this application. CFT90 will give you a more visible beam compared to a say, a Black Flat, but the Black Flat will give you a more narrow beam that might suit your installation better, not to mention considerably cheaper, and still can be very visible if you rig the room with some light fog. 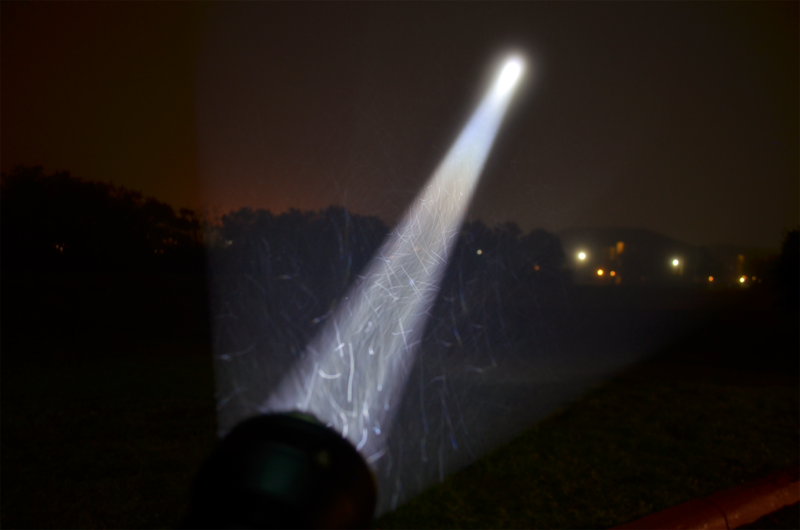 Here is the Black Flat in a 2.5” reflector (Acebeam T21 host) on a foggy night. A COB will not work, it needs to be a very small LED and a very large aspheric plano-convex lens. Are you building it yourself because it needs to “be spinning around” or because of cost reasons? Because moving heads that spin around already exist, that is how you get those tight beams of light, only problem is that they cost a few thousands each. Moving heads almost all use lamps, not LEDs, so they will usually have a much brighter beam. There has to be some kind of store somewhere near you that can let you rent out some moving heads for an installation, unless you live in a smaller city or rural enviornment. You made clear to me that a very bright small led combined with a very large aspheric plano-convex lens will give me the result I desire. Thanks for that. The references to moving heads are also really spot on. Does anyone have an idea how they get these up to 200w LED, 10985lumen with straight beams? And second question, if I would need to crank up the brightness a lot while keeping the beam narrow, what would be a logical step? Discharge lamps with different lenses? The ones with those 200W LEDs and 10k lumens make straight beams by using a shutter to reduce the beam size. So you end up getting much lower lumens out of the light when the beam is in the “tight” mode. Essentially they are taking a big LED and blocking most of it, so basically making it into a small LED and wasting light. The only moving heads that will have a tight beam while also outputting thousands of lumens are short arc based ones, not LED ones. Hello Joep. You might want to look into Vari-lites. Robust beam shaping and motor control. These are the darling of Hollywood and theatre. Capable and yes, expensive, and in some locales rentable. They are a lot of fun to use. I think you missed the point that he is trying to build it himself. Buying a moving head has already been recommended previously.